Food is a crucial part of any party. 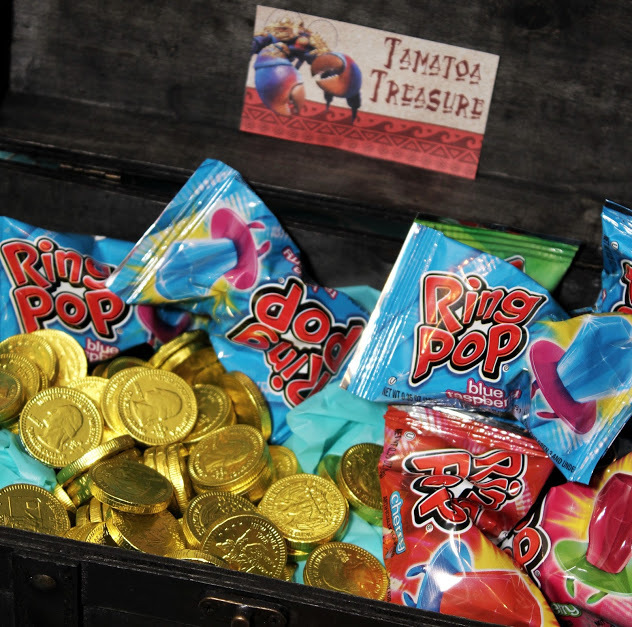 We served Hei Hei (chicken tenders), Pua (Pulled Pork on Hawaiian Rolls), Driftwood (Pretzel Sticks), Fruit of Tefiti, Fish and Chips (Goldfish and Chips and Salsa), Tekah Lava Rocks (rock candy), Toatoma Treasure (Ring Pops and Chocolate Coins) and Ocean Water (Pineapple Juice, Sprite and Hawaiian Punch). 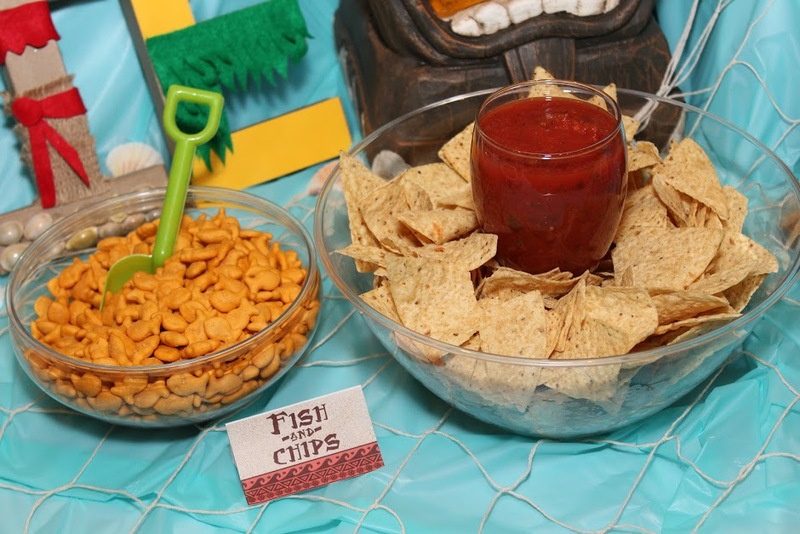 Download the free printable cards for these Moana themed party foods at the bottom of this post. I made Moana themed letters to spell my daughter’s name. The paper mache letters were half off at Hobby Lobby. Most supplies I used came from my existing craft leftover stash. Each letter was inspired by a character from the movie. I also made a giant 2 out of leftover Hawaiian flowers. 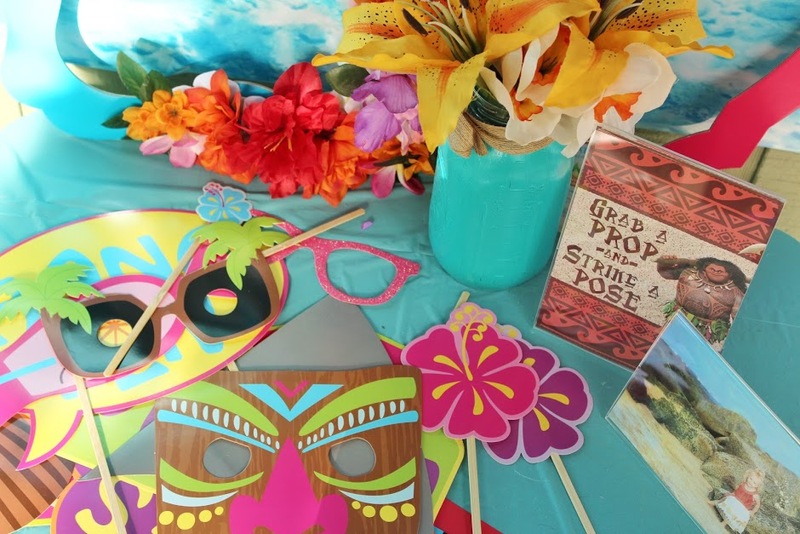 Overall both projects cost less than $20 to make and they were such a focal point of our food table as the perfect DIY Moana Birthday Party Decorations. 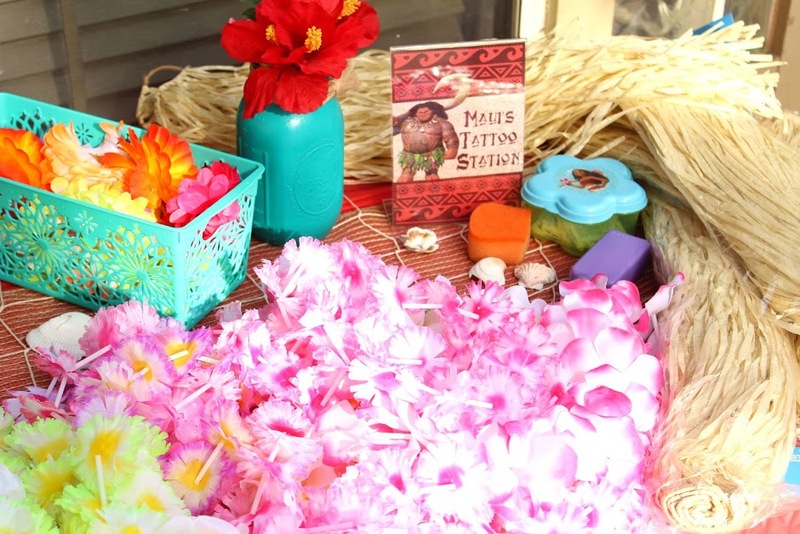 I purchased a lot of luau party supplies from the Dollar Tree including these Kakamora Coconut Cups, colorful leis, hair clip flowers, grass skirts and Moana themed tattoos for our Maui Tattoo station. 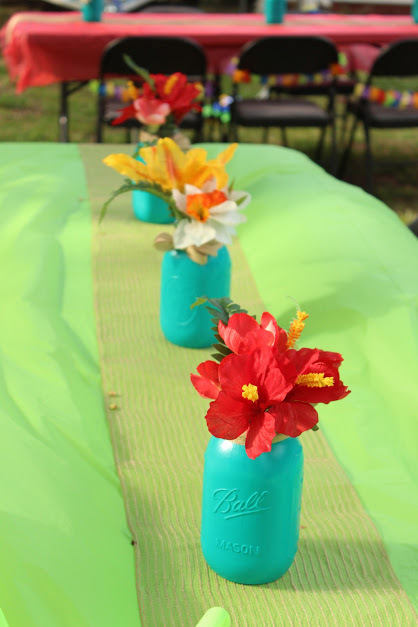 These beautiful hibiscus flower centerpieces were from the Dollar Tree as well and the turquoise mason jars were reused from my sister’s wedding. 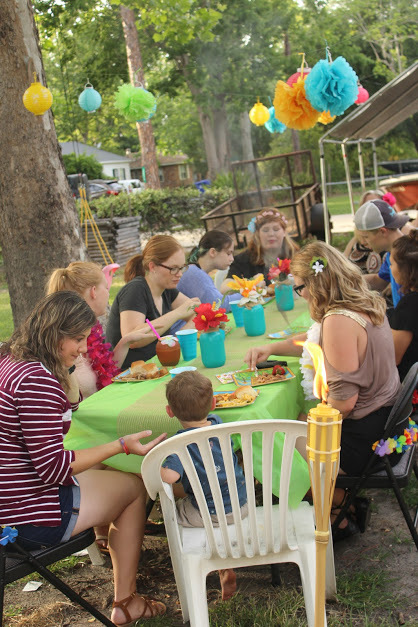 We covered the tables in bright colored plastic tablecloths and used a wire and jute runner from the floral department at Hobby Lobby (one $5 roll covered 4 tables). I also used tiki torches all around the yard with citronella oil to help keep the bugs away. Guests could enjoy corn hole, swimming in the pool or playing in the sandbox while outside. We hung paper lanterns and tissue pom poms from the tree outside. I mixed in ocean net and seashells all over to give it an easy and affordable Moana feel. 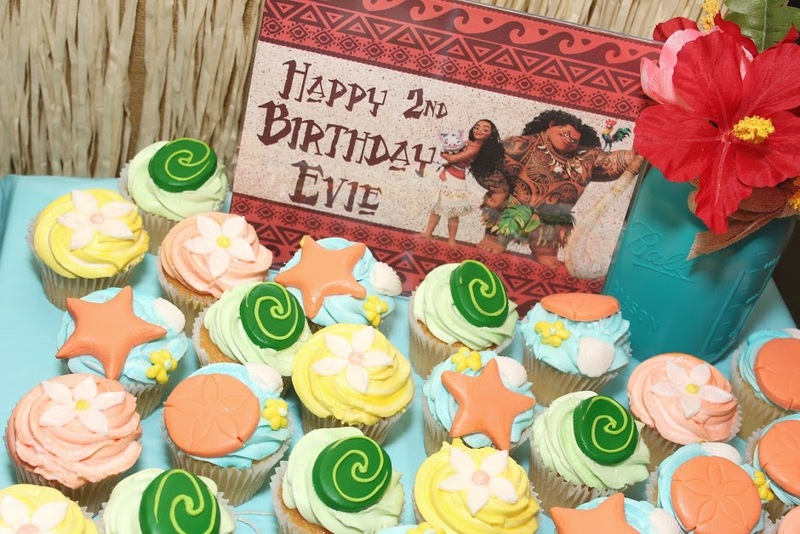 WANT TO RECEIVE MOANA BIRTHDAY PARTY PRINTABLES FOR FREE? Join my VIP Facebook group to access the following: Kakamora Coconut Cups 5×7″ Happy Birthday 8×10″ Maui’s Tattoos 5×7″ You’re Welcome 5×7″ Pre-filled Food Tent Cards Follow this link to join: https://www.facebook.com/groups/mommyofaprincess/ Answer the questions and once approved, you’ll be granted access. Click on “files” to see all free printables for check out the pinned post. If you DO NOT have a Facebook, you can subscribe to my mailing list below. Once you have submitted your info, you will receive an EMAIL to confirm your SUBSCRIPTION. After confirming your email you will receive a link to download the files, as well as login information to access my full FREE Printable Library. If you do NOT receive an email in your inbox, PLEASE CHECK YOUR SPAM! Subscribe to our mailing list to receive your FREE printables! I just found you through Pinterest! 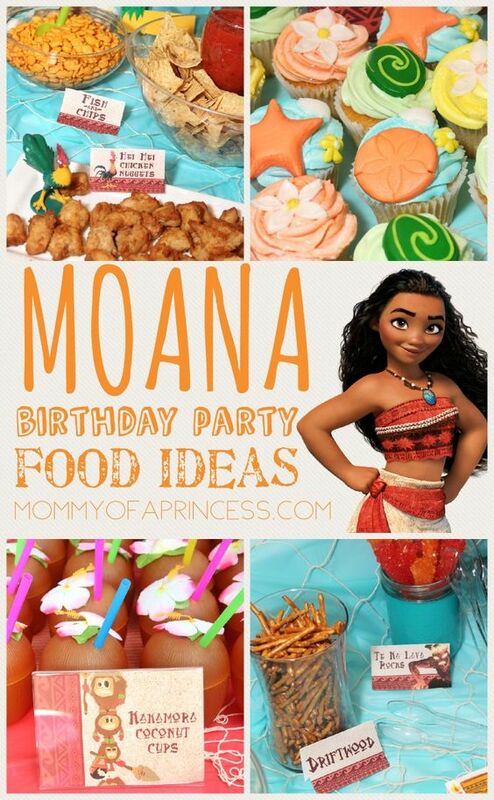 Looks like you and I are kindred spirits; I too am a huge fan of parties and Disney 🙂 Love this idea for a birthday party, my 4 yr old daughter is OBSESSED with Moana! So fun! THANK YOU for the free printables! You’re so welcome! I hope your party is a hit! Hi there!!! I subscribed but never got the printables!!! Help! And btw, ADORABLE!!! 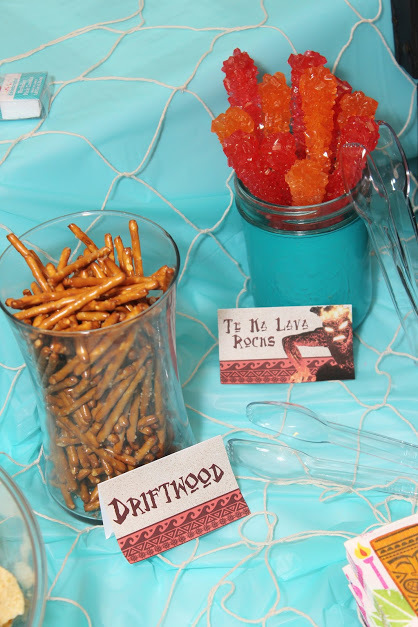 I was so excited to come across your Moana themed party. My daughter turns 3 Thursday and has been asking for a Moana party for months now. Thank you for sharing your printables. Were you able to find the graphics online somewhere? I have a couple of additional items on my menu and would prefer they all match.They really only need to look like Driftwood or Fish and Chips. Thanks for any help! Hi, I’m interested in finding out how you did those really cute cupcakes. Thanks so much! Hi! I didn’t make them myself, I wish I was that talented! I actually took pictures and color samples in to my local Publix bakery and they were able to customize them for me! Where did you find that totem pole pedestal (I can’t figure out hoe else to describe it)? That thing is awesome! Thanks so much for the free printables!!! how did the coconut cups work out?? I saw them at the store but wasnt sure if they would be too flimsy! I haven’t received my printables. just wondering when I would be receiving the link for them to my email….? Hi Michelle! I would double check your spam or junk mail as it’s an automated email upon subscription confirmation 😉 If not, just let me know your email and I can send them to you manually. Thanks! Hi, just wondering how long it takes to get the printables emailed? 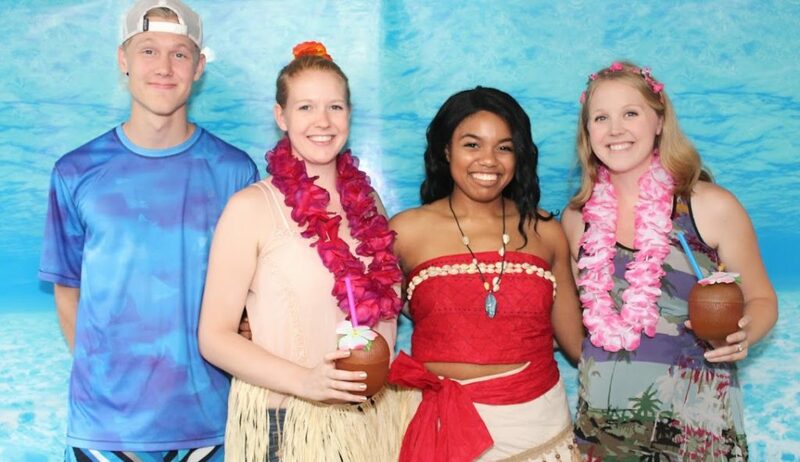 Your party looked amazing! Love it all! 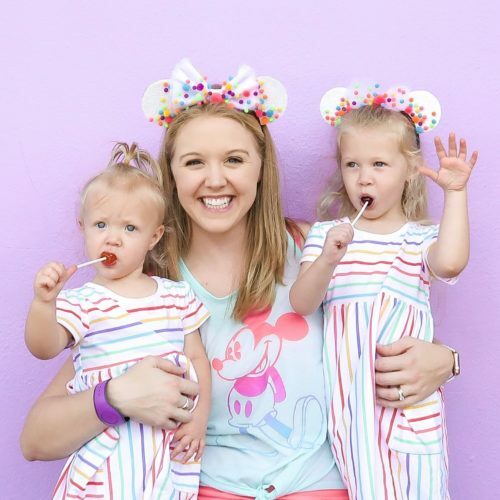 Where did you find/buy your daughter’s outfit? I purchased it from Little Adventures! We love their princess dresses! They’re machine washable and super comfy! Thank you so much for the free printables! My daughter is obsessed with Moana!! its going to be Hawaii in winter! haha she loves Moana! thank you again for all the inspiration! Hi! I was just wondering where u got the straw(?) behind the food table from? What is it called?? 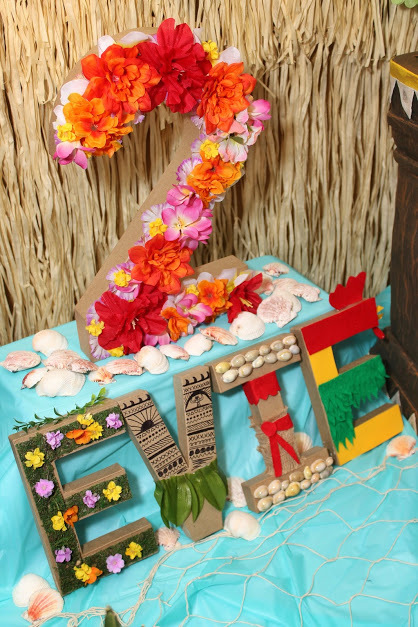 Hello, I’m throwing a Moana party for my daughter – how did you get or do the number 2? I didnt receive my free printable food tag link. Can you please help? Love your ideas and excited to use them for my sons party! Hi Michelle! Thank you!!! Be sure to check your spam folder as sometimes the email with the link ends up in junk or other ? If not, email me and I’ll assist! Thanks for reading! I hope your son’s birthday is extra fun! ? 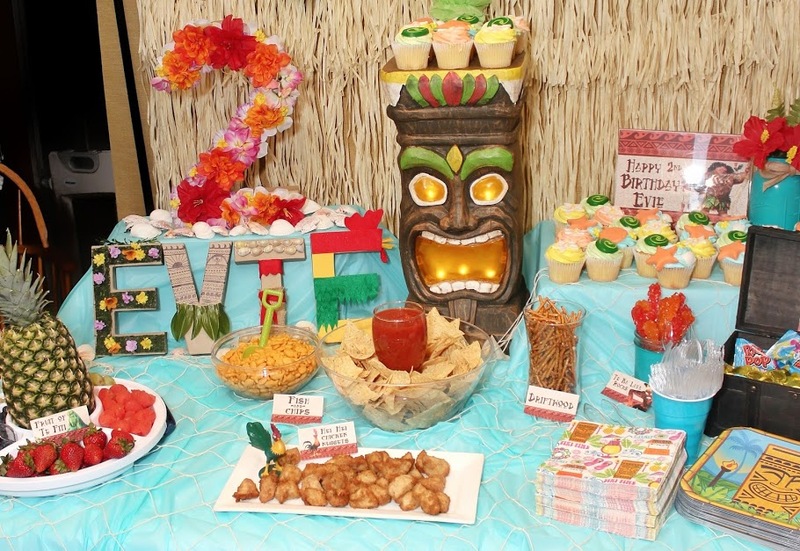 My daughter is turning 2 and wants a Moana party this year. The la for the ideas. My daughter’s nickname is Evie. I love all of your ideas! I’m curious, where did you purchase the rock candy? It seems so expensive everywhere! Hi Jessica! Thanks for reading! I waited for an emailed coupon from Party City and then purchased it from there 🙂 I hope your party is a hit! Hi! Thank you so much for the printables, they are great! Quick question, did you print these out on cardstock paper or just regular printer paper?